Eye floaters are very common and are usually no reason for alarm. They occur most often in those over the age of 50. Eye floaters are rare in someone under 16 years old. But nearly everyone over the age of 70 has them. Eye floaters may occur in one or both eyes. Some people see a single floater, while others may see hundreds. 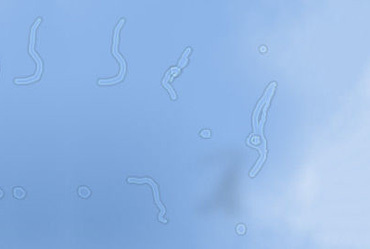 The floaters appear as dark specks and are more visible under certain lighting conditions than others. They can’t be seen in darkness, but are especially noticeable against a bright sky. They are not visible when the eyes are closed. Eye floaters develop when the vitreous humor, which is the gel-like substance in the back 2/3 of the eye, becomes more liquid and loses its natural clarity. With age, the gel shrinks and pulls away from the eyeball. This shrinkage causes tiny pieces of the vitreous humor to stick together and form clumps that cause shadows on the retina. These shadows appear as specks or cobweb-like structures. Movement of the eye causes these particles to move within the eye. This makes the shadow appear to be floating. While this can be distracting, it is not a serious condition in most cases. However, sometimes the floaters can be a sign of something very serious. The sudden appearance of a large number of floaters, especially along with flashing lights, is an indication of a tear in the retina. This requires immediate medical treatment to prevent retinal detachment. A loss of side vision, along with the floaters and flashes, is a sign of retinal detachment and must be treated immediately to prevent permanent blindness. There are several risk factors associated with eye floaters. The main one is age – anyone over 50 is almost certainly going to experience eye floaters at some time. Near-sightedness is the main risk factor for someone under the age of 50. Past eye trauma or eye inflammation can lead to floaters. Diabetic retinopathy is another risk factor for eye floaters, as well as complications of cataract surgery. There is no proven way to remove eye floaters with medication, vitamins, or any other such product. Laser surgery has been used to try to break up the clumps, but the results have not been satisfactory. This procedure also carries a huge risk to otherwise good vision. When the floaters cause a serious problem with vision, a procedure called vitrectomy may be used. This involves using a hollow needle to draw out vitreous humor and then replace it with a saline solution. This procedure is not likely to remove all the floaters and may cause a retinal detachment and cataract. Eye floaters usually become less noticeable with time. They will actually decrease in size and darkness due to the natural absorption within the eye. They may also shift their position, making them less in the field of vision. Many people just get used to them. Their brain adapts to the floaters and they don’t even notice them.